Your Fears, The Press, And the Reality of Safe Travel In Mexico From a ExPat! Many people for some reason do not know that Marina Vallarta in Puerto Vallarta Exist. It is rated in the top ten private marinas in the world and nobody knows about it. There are 150 shops, 15 restaurants, El Faro Bar where the likes of Mel Gibson visit when in. When it comes to Hollywood types, PV is where they started and their homes are spectacular old money homes! 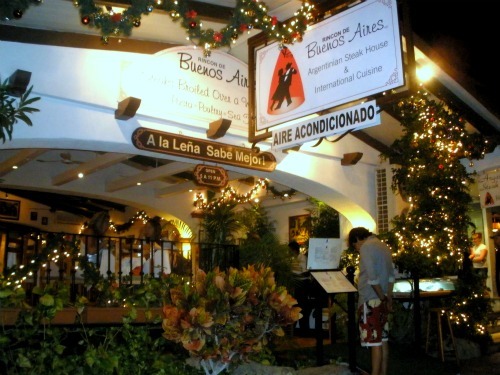 All in Marina Vallarta´s ¨other¨ Malicon or Board Walk. The Dollar is strong, hotels and airfare´s are way down. Occupancy is down as well everywhere. We´re still, Two years running now, Put Puerto Vallarta as the best place on Earth to Retire! The G-20 World Economic Summit happened in Cabo. We had he World Economic Conference of Latin America. We had Tiangue A primarily Latin America Tourist Convention that focuses on world markets, including travel from Latin America to North America ( http://tianguisturisticomexico.com.mx/?en). 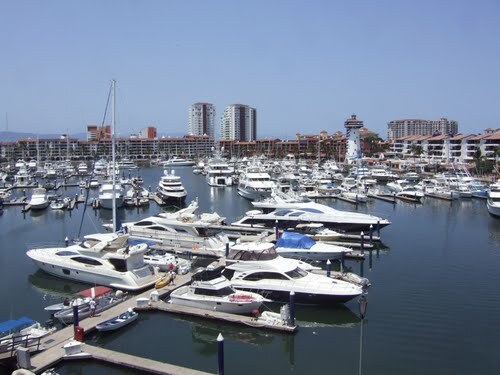 Marina Vallarta is Rated one of the top ten Private Marinas in the world! Do you know hot to find it? On top of that Mexico tourism is BOOMING, that´s right, I said booming… Tourism in Mexico was up to 22 million North American and European Visitors, the majority being American. Obama was down here in with his daughter for Spring Break and the president tried to squash the story (http://www.snopes.com/politics/obama/maliamexico.asp). All of this and much, much more and all the American press sees and writes about is ¨How you´re gonna die if you go ANYWHERE in Mexico¨! Some stupid incident where a stupid man tried to rob some tourist bandito style made the press releases and there goes another reason to tell the world how dangerous Mexico is and how thousands and thousands of drug related deaths occurred in ALL of Mexico. I even saw one article on CNN.com showing dead people face down in the streets as the headlines read something about how forty people were found dead near Cancun. Yep, About 150 miles east of Cancun, I guess that´s close enough to lob a press bomb designed to cause as much damage as it can to an unsuspecting public being told anything that will scare them into staying at home. As you read the article there was some tiny words that said the photo was taken two years prior to this article in Juarez, a battle zone from the beginning of time. There is not enough room in this article for this vein…. But the American press is pushing fear and screaming once again that the Sky is falling and you better take cover for the impending death in your family as you will surely experience if you come to Mexico for a vacation you well deserve. They also like to quote how 120 American died in Mexico last year, but forgot to tell you what they died of! Heart attacks, strokes, car accidents, some crime of course, but an unspoken fact is the same as a lie. As these news channels scream at the top of their lungs Mexico is Dangerous tourism SHOT UP to 22 million visitors. So what do you think that means? My seasonal regulars love the idea that people are staying away from the Marina and Mexico in General! They have the place to themselves and they laugh at those who are so easily manipulated by agendas. The Dollar is going so far these days that with the difference in the exchange rate to what the actual cost is, it´s like a 20% automatic discount. If you are smart enough to come down with a fist full of pesos, paying cash makes everything cheaper without the 6% commission they charge for credit card use. Now the credit card companies charge six percent in Mexico. I also know Mexicans are more savy than Americans when it comes to how money works and they don´t take a discount because you ¨can´t¨ afford to pay cash. That´s right amigos, Mexicans don´t think credit is an investment tool like Americans. They see it as a very bad idea on several planes, but are happy to take your credit cards. You need to be careful, but they love ´em! Map of Marina Vallarta so you can find it. That all sounds pretty Bad, but when the press quotes numbers, how do you know if that number is a good number or a bad number. It´s a number put to you in a way where you are led to be shocked through voice inflection and visuals like two year old photos in completely different cities. As the papers beat on Mexico about how Americans are victims just waiting for something bad to happen to them, the numbers don´t support their claims, yet they keep spewing this crap like they´re protecting the American Public. And even with the 22 million visitors, it makes me wonder how many people can´t afford American Vacations and don´t go anywhere and wind up staying home choosing local short trips instead. Cities like Chicago are dangerous beyond belief (http://www.chicagotribune.com/topic/crime-law-justice/crimes/shootings/020010001165.topic), Washington D.C. is a war zone with Gang Killings, Americas Cartels (http://www.nationalgangcenter.gov/Gang-Related-News?st=DC), or how dangerous the city is in genera. Here are some facts that show Washington D.C. as more dangerous than IRAQ, yet they say that about Mexico (http://archive.newsmax.com/archives/ic/2006/5/29/132706.shtml) and the lonely planet blog: http://www.huffingtonpost.com/lonely-planet/are-americans-safer-in-me_b_1503288.html . Now if you look at Houston Texas, the city stats show 22,595 violent deaths occurred with 117,494 property crimes and I dare you to read this page with Statistics that will raise your eye brows. But with 22 thousand violent deaths in Houston alone, Mexico looks like Disney Land to many, if not most of American cities. This site shows America’s figures as well with 778,901 violent deaths in America Alone (http://www.neighborhoodscout.com/tx/houston/crime/). So what numbers do you want to talk about, I mean really you wanna start with the sky is falling statements. I can go shot for shot amigos. So what is his point of this article? Well first of all if you hear it first hand from a Puerto Vallarta Local, you´ll believe it and give it a second thought when the American press lobs another bomb designed to ruin tourism. Now nobody is going to say you won´t find crime anywhere, even in Disney Land there is crime. You can´t stop it, people get desperate, like in America and do stupid things. But these things are not involving Americans and tourist in any manner. Yet the ¨Sky¨ is falling continues…. 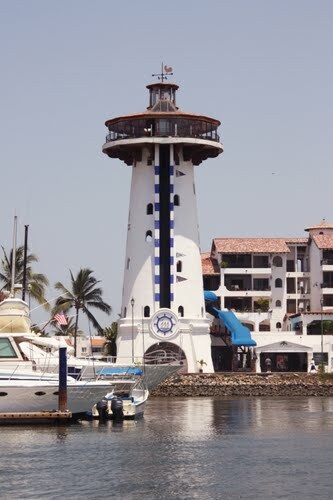 El Faro or The Light House in English… Viewed from the Water is Marina Vallarta´s Land Mark! Here in Mexico, the one percent that goes fishing has stopped dead. Cautious people with money ignore the discounts since they don´t worry much about these things. But they believe where there is smoke there is fire and nobody wants to get burnt. So Mexico sees an invasion of tourism on the cheap. They don´t go to restaurants, they don´t take tours, they don´t buy things and stay in the all inclusive hotels where they have everything they need onsite. Of course this doesn´t help the local economy and in fact should be illegal in my opinion. Yes have restaurants in the hotels and yes people can eat there. But putting food handcuffs on people who spent their last dime to stay in some cheap all inclusive torture hotel and don´t venture out to see the city is a true crime. Many of the best restaurants in Mexico are located here in Puerto Vallarta, yet find it hard to fill their establishments. That goes for the North Americans. What most people don`t understand is that Mexican Nationals are not exactly broke and while they don´t live the high life they consider Americans live, they are happy, clean, safe and loving people. They love to take the family and get away to the beaches for holidays. They rent hotel rooms, they eat cheap for the most part, but the upper percentages attend the nicer restaurants late in the evening and will stay until all hours of the morning eating, drinking, and eating some more. To be honest it is in fact the Mexican economy that is keeping Mexico going. Tourism is important, but unlike most North American minds, Mexico really does not need America to survive. Tourism guys like me will have to agree, but tourism is our life, not all of Mexico’s Existence. Since I own Master Baiter´s Sportfishing and Tackle, I have to talk fishing here. What has happened to fishing in Puerto Vallarta is a sad state of affairs. In 2009 there were 29 separate fishing companies where you could for a decent price go fishing here in Puerto Vallarta´s World Famous Fishing Grounds. You name the species, we most likely have it. You name the day, You´ll catch trophy sized Game fish. You name a budget, then we find problems. Close to four years later fishing companies like Mr. Marlin, PV Fishing and several others are now homes for Timeshare OPC´s and ¨Pirates¨ or CockRoaches as I refer to them as. They have taken over Marina Vallarta. They tell you Master Baiter´s will rip you off and unknowing tourist listen as they look for me. This coming from gang bangers kicked out of the United States. I have always known they tell people I am dead, especially now that I am in a new location. But these guys are chasing people up and down the Malicon which in turn causes stress in the visiting tourist so they run past shops in an effort to get away from these less than desirables. Yet there are those who hunt them down for the 200 bucks for a timeshare presentation and free tours they can get. I guess it takes all kinds. They are selling $45.00 dollar golf tickets to Marina Golf Course left and right, but the tickets are bogus. When the folks confront the criminal, THEY act like they´re calling the police, the shaky tourist leave afraid to deal with the Mexican Police. The scam continues today…. If they can´t get you interested in a boat for the price they are quoting, then they sell you a really, really great boat for next to nothing. Greed kicks in big time, the deposit is made, the boat never shows up and then the dance starts again. You show up, they call the police, you run, they sell the next boat. People, what are you thinking, you never ever give trust to a complete stranger walking on the Malicon or boardwalk with a book full of pictures. I mean really, just give your money to Mr. FlimFlam the Timeshare Criminal! I don´t feel sorry for you, yet you come back the following year and do the same exact thing with a different cockroach with the same results. Fishing has always been expensive, it will always be expensive and those looking for cheap prices should expect disappointment. But I blame the credit boom, credit was stupid easy, and every guy with a panga and a dream to live the Jimmy Buffett lifestyle came down and put a shingle up. Next thing fishing is booming. Big fish, lots of fish and plenty of people euphoric with credit cards purchased everything in sight. Next thing you know there are more boats and fishing companies than there are people who what to go fishing. Now remember this was when everyone was flush with cash, so the prices dropped and dropped and then hit fuel prices. Boom time fishing and everyone is going broke just to get the guy who would pay for the fuel as they hope for a tip at the end of the day. Amazing, but this is how it worked. Then the Swine flu, Economy crash, the press with their favorite subject and then finally the national travel warnings that flat out stated to just stay out of Mexico(!?) …. The party was over. People losing their homes are not people who go fishing. Then the glut of toys in the form of boats made things even worse. Now you find boats are going out unmaintained. Half fueled, going slow to save fuel, not hitting the spots they are paying for. Bad Equipment where small fish are snapping rotten line. Radios for emergencies are a luxury in their world. GPS is almost always a 100 dollar hand held with no sounder for the high spots or to spot fish. Insurance, are you kidding. Captains with licenses, well they cost money and really who needs a captains license when a cheap price does the job. With a crooked Port authority for three hundred dollars a month in his back pocket I can go without insurance, paying taxes, captains licenses, safety equipment like life savers and radios. It doesn´t matter, as long as you volunteer to be a victim you will have these guys in the Marina. Fast forward, things are exactly the same, except only a few have survived besides me. They are pushing timeshare to pay the bills until they realize these timeshare OPC´s screw everyone, even their business partners. To be frank it makes me laugh, no honor among criminals. Ultimately the fishing industry has come to close to a complete halt as fishing is getting better by the day. But besides my personal problems with these cockroaches, they are not enough to chase people out of the marina and there are things that can be done if abused by some crook pushing bogus golf tickets and nonexistent boats. Yes there are police in Marina Vallarta and there is no reason to fear them. They will most likely not understand English, but I speak a fair Spanish so I´ll be there if you need help like this. But this is what Master Baiter´s is really all about, fun in paradise comes with a safe environment for everyone. If you have been ripped off, come see me, I can get things straight one way or another, trust me! 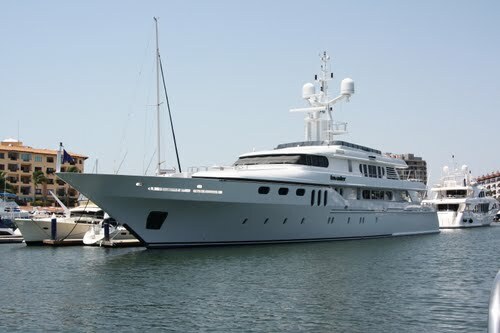 Invader, Our Resident Yacht. Everyone lovesit beinghere and we all talk about it … not to mention knowing the entirecrew and Captain. Great People living a fine life! But this is the down side, always where there is tourism there are some low life’s looking to prey on innocent people who are too trusting with good English speaking strangers! For the person who just doesn´t know about coming to Vallarta, show this article to them, it will at least open the mostly closed mind. Take care and I´ll keep a cold one handy for you….. This entry was posted in Puerto Vallarta Sportfishing and tagged Big Game Fishing, charters, Deep Sea Fishing, Fishing, Fishing Puerto Vallarta, Marlin, Mexico, Puerta Viarta, Puerto Vallarta, Puerto Vallarta Bloody Decks, Puerto Vallarta Fishing Reports, Sailfish, Sportfishing, Travel, Tuna fishing, www.Masterbaiters.com.mx, Yellowfin tuna. Bookmark the permalink. Puerto Vallarta Big Game Fishing Delivers, Marlin, Sailfish, Yellowfin Tuna R Here Now!